The 1932 Summer Olympics, officially known as the Games of the X Olympiad, was an international multi-sport event that was held from July 30 to August 14, 1932, in Los Angeles, California, United States. The Games were held during the worldwide Great Depression and some nations were unable to pay for the trip to Los Angeles; 37 nations competed compared to 46 in the 1928 Summer Olympics in Amsterdam. Even U.S. President Herbert Hoover failed to put in an appearance at the Games. The organizing committee did not record the finances of the Games in their report, although contemporary newspapers claimed that the Games had made a profit of US$1,000,000. The selection of the host city for the 1932 Summer Olympics was made at the 23rd IOC Session in Rome, Italy, in 1923. Remarkably, the selection process consisted of a single bid, from Los Angeles, and as there were no bids from any other city, Los Angeles was selected by default to host the 1932 Games. Paavo Nurmi was suspended from competition by the IAAF for alleged violation of amateur rules. Finns charged that the Swedish officials had used devious tricks in their campaign against Nurmi's amateur status, and ceased all athletic relations with Sweden. A year earlier, controversies on the track and in the press had led Finland to withdraw from the Finland-Sweden athletics international. After Nurmi's suspension, Finland did not agree to return to the event until 1939. In field hockey, only three nations took part. The host nation lost both matches, 1–24 to India and 2–9 to Japan, but still won a bronze medal. Poland's Stanisława Walasiewicz won the gold medal in the women's 100 m; she would also win the silver medal in the event four years later. After her death in 1980, it was discovered that she was intersex and would have been ineligible to participate. Eddie Tolan won both the 100 m and 200 m sprint events. Romeo Neri won three gold medals in gymnastics. Helene Madison won three gold medals in swimming, while the Japanese upset the men's events and took all but one title. Takeichi Nishi (Baron Nishi) was the gold medalist with his horse Uranus in the equestrian show jumping individual event. Nishi's gold medal is Japan's only gold medal in the equestrian event to this day. Nishi would later die in 1945 as an officer stationed in the defense of the island of Iwo Jima, and as such is an important character in Clint Eastwood's film, Letters from Iwo Jima. Kusuo Kitamura won the gold medal in the men's 1500 meter freestyle swimming race. He was and continues to be the youngest ever male swimmer to win a gold medal at the Olympic Games. Dunc Gray won Australia's first cycling gold medal; he set a world record of 1m 13s in the 1000 time trial. The Dunc Gray Velodrome, built for the 2000 Sydney Olympic Games, was named after him. Due to an official's error, the 3,000 m steeplechase went for 3,460 m, or one extra lap. 117 events in 20 disciplines, comprising 14 sports, were part of the Olympic program in 1932. In one of two Equestrian jumping events (team competitions) no medals were awarded. The number of events in each discipline is noted in parentheses. The Art competitions at the 1932 Summer Olympics awarded medals for works inspired by sport-related themes in five categories: architecture, literature, music, painting, and sculpture. Fifteen sports venues were used for there 1932 Summer Olympics. In order to control cost in the wake of the Great Depression, existing venues were used. They included two golf courses, two city parks, three public highways, and a city road. The Swimming Stadium was the only new venue constructed for these games. The Rose Bowl, constructed in 1921, was made into a temporary velodrome for track cycling events under the auspices of the Union Cycliste Internationale (UCI). The Los Angeles Memorial Coliseum, constructed in 1923, was used as the Olympic Stadium. The Olympic Auditorium was constructed in 1924 in preparation for Los Angeles being awarded the Games; it was modified to meet the specifications of the boxing, weightlifting, and wrestling federations. Long Beach Marine Stadium was created in 1925 when Alamitos Bay was dredged, then further dredged seven years later in time for the 1932 Games. Elysian Park, the oldest city park in Los Angeles, was founded in 1886, and has been part of the Los Angeles Police Department (LAPD) training academy since 1925. The Riviera Country Club opened in 1926 as the Los Angeles Athletic Club Golf Course and was renamed Riviera by the time of the 1932 Games. The swimming stadium, constructed adjacent to the Coliseum in 1932, was intended to be a temporary structure. Riverside Drive, Los Angeles Avenue, Vineyard Avenue, and the Pacific Coast Highway were common driving routes in California at the time of the 1932 Games. The Coliseum was the first home for the Dodgers Major League Baseball (MLB) team when it moved from Brooklyn, New York in the 1958 season. The following year, it hosted the MLB All-Star Game and the World Series. Once Dodger Stadium was completed in 1962, the Dodgers moved there where they have been since. The Los Angeles Rams National Football League (NFL) team used the Coliseum as its host stadium from 1946 to 1980 when it moved to Anaheim, located southeast of Los Angeles. It also hosted what would become known as Super Bowl I in 1967. Even the American Football League's Chargers used the Coliseum as a venue in 1960 until their move to San Diego the following year. The Coliseum continues to host USC Trojans football games to this day, and also hosted UCLA Bruins football for a number of years. The Rams return to the Coliseum in 2016. The track constructed in the Rose Bowl was given to the Tournament of Roses Association upon completion of the 1932 Games. The Bowl was expanded between 1932 and the 1984 Summer Olympics three times, increasing its capacity from 83,000 in 1931 to 104,594 in 1972. It hosted Super Bowl XI in 1977, where the Oakland Raiders defeated the Minnesota Vikings 32–14. It is the current home of UCLA Bruins football and the Rose Bowl Game, and was the home of the L.A. Galaxy soccer team for a number of years. Elysian Park's shooting range was left intact for the LAPD to use. Sunset Fields Golf Club was renamed Brentwood Country Club in 1941 and is still in use as of 2010. All of the road courses were returned to public usage after the Olympics. The Olympic Auditorium continued to be of use for boxing and roller derby events until June 2005 when it was bought to be used as a megachurch. Los Angeles Harbor continues to be a major sea port in the Western United States, employing 919,000 people and generating US$39.1 billion in annual wages and tax revenues as of 2007. The Riveria Country Club continues to host golf events, hosting the 1948 U.S. Open and the PGA Championship in 1983 and 1995. The Swim Stadium was renovated in 2003 and continues to be in use as of 2010. For the 1984 Summer Olympics, the Coliseum and the Rose Bowl were used as venues. A total of 37 nations were represented at the 1932 Games. Colombia made its first appearance at the Olympic Games, and the Republic of China competed for the first time after its failed appearance at the 1924 Games. These are the top ten nations that won medals at the 1932 Games. ^ a b Hoover, who also skipped the 1932 Winter Olympics in Lake Placid, New York, was the second U.S. president to miss a Games in the United States held during his term. The first was President Theodore Roosevelt, who decided not to attend the 1904 Summer Olympics, held in St. Louis, Missouri, because St. Louis mayor David R. Francis declined to let Roosevelt help officiate. Zarnowski, C. Frank (Summer 1992). "A Look at Olympic Costs" (PDF). Citius, Altius, Fortius. 1 (1): 16–32. Retrieved March 24, 2007. ^ "Past Olympic host city election results". GamesBids. Archived from the original on March 17, 2011. Retrieved March 17, 2011. ^ 1932 Los Angeles Olympic Athlete's Village in Baldwin Hills, Accessed November 12, 2007. ^ Los Angeles Memorial Coliseum Archived November 14, 2007, at the Wayback Machine, National Landmarks Program, National Park Service, Accessed November 12, 2007. ^ a b "Finland and Sweden renew old rivalry on the athletics track this weekend". Helsingin Sanomat. 29 August 2008. Retrieved 20 August 2012. ^ Jalava, Juhani (15 March 2005). "1925–1935: Yleisurheilu sai Suomen liikkeelle" [1925–1935: Athletics got the Finnish launch]. Turun Sanomat (in Finnish). Archived from the original on 13 February 2013. Retrieved 16 September 2012. ^ Lynch, Steven. "What was unusual about the 3000-metre steeplechase final at the 1932 Olympics?". www.espn.co.uk. Retrieved June 25, 2012. ^ a b c d e f 1932 Summer Olympics official report. Archived April 10, 2008, at the Wayback Machine p. 74. ^ History of the Rose Bowl Stadium. Archived October 15, 2010, at the Wayback Machine Accessed 13 October 2010. ^ a b 1932 Summer Olympics official report. Archived April 10, 2008, at the Wayback Machine pp. 61-8. ^ History of the Los Angeles Memorial Coliseum. Archived October 27, 2010, at the Wayback Machine Accessed 13 October 2010. ^ a b 1932 Summer Olympics official report. Archived April 10, 2008, at the Wayback Machine p. 70. ^ Long Beach Marine Stadium information. Archived October 2, 2010, at the Wayback Machine Accessed 13 October 2010. ^ History of Elysian Park. Archived December 18, 2005, at the Wayback Machine Accessed 13 October 2010. ^ History of the Los Angeles Department Police Academy. Accessed 13 October 2010. ^ History of the Riveria Country Club in Pacific Palisades, CA: 1931-8. Archived March 25, 2010, at the Wayback Machine Accessed 14 October 2010. ^ a b 1932 Summer Olympics official report. Archived April 10, 2008, at the Wayback Machine pp. 68, 79, 83. ^ a b c d e 1932 Summer Olympics official report. Archived April 10, 2008, at the Wayback Machine p. 87. ^ a b c 1932 Summer Olympics official report. Archived April 10, 2008, at the Wayback Machine p. 86. ^ 1958 Los Angeles Dodgers Baseball-Reference season page. Accessed 15 October 2010. ^ 1959 All-Star Game Baseball Almanac. Accessed 15 October 2010. ^ Baseball-reference.com profile of the 1959 World Series. Accessed 15 October 2010. ^ MLB.com profile of Dodger Stadium. Accessed 17 October 2010. ^ NFL 2001 Record and Fact Book, Workman Publishing Co, New York, ISBN 0-7611-2480-2, p. 280. ^ Pro-Football Reference.com of the 1980 Los Angeles Rams. Accessed 15 October 2010. ^ NFL.com history of Super Bowl I. Archived September 5, 2015, at the Wayback Machine Accessed 15 October 2010. ^ Chronology of the San Diego Chargers: 1959-69. Archived October 12, 2009, at the Wayback Machine Accessed 15 October 2010. ^ a b Facts about the Rose Bowl Stadium. Archived June 5, 2013, at the Wayback Machine Accessed 15 October 2010. ^ Golfcalifornia.com profile of the Brentwood Country Club. Accessed 15 October 2010. ^ LASports.org profile of the Grand Olympic Auditorium. Accessed 15 October 2010. ^ Electronic Press Kit of the Port of Los Angeles. Archived September 27, 2010, at the Wayback Machine Accessed 15 October 2010. ^ United States Golf Association US Open past champions: 1895-2009. Accessed 15 October 2010. ^ PGA Media Guide of the 1983 PGA Championship. Accessed 15 October 2010. ^ PGA Media Guide of the 1995 PGA Championship. Accessed 15 October 2010. ^ LaParks.org profile of the LA84 Foundation/ John C. Argue Swim Stadium. Accessed 15 October 2010. ^ 1984 Summer Olympics official report. Archived November 2, 2010, at the Wayback Machine Volume 1. Part 1. pp. 72-9, 129-131. Accessed 15 October 2010. ^ 1932 Summer Olympics official report. Archived April 10, 2008, at the Wayback Machine pp. 67-8, 70, 78, 84. ^ 1932 Summer Olympics official report. Archived April 10, 2008, at the Wayback Machine pp. 76, 78, 585. ^ 1932 Summer Olympics official report. Archived April 10, 2008, at the Wayback Machine pp. 70-73. ^ 1932 Summer Olympics official report. Archived April 10, 2008, at the Wayback Machine pp. 73-4, 572. ^ 1932 Summer Olympics official report. Archived April 10, 2008, at the Wayback Machine p. 574. ^ 1932 Summer Olympics official report. Archived April 10, 2008, at the Wayback Machine pp. 77, 86-7. 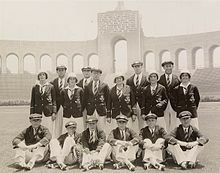 Wikimedia Commons has media related to 1932 Summer Olympics. "Los Angeles 1932". Olympic.org. International Olympic Committee. "Results and Medalists — 1932 Summer Olympics". Olympic.org. International Olympic Committee.